Is waste segregation truly difficult to achieve? I don’t think so. This is what I wrote for Citizen Matters in November 2009 on how intimidated I was the moment I was told more than five types of waste had to be segregated at source! Dry waste, wet waste, metal waste, e-waste, bio-waste, plastic waste… How many dustbins should I keep at home to segregate these many waste matters? This is what struck me when I read a circular from the Brigade Regency Owners’ Association, making waste segregation compulsory and for a moment I thought I would crumple it up and dump it in the dustbin. Brigade Regency Apartments is where I live. Being a resident here, I felt “these guys are stretching it a bit too far”. How will I train the domestic help and who has so much of time and patience anyway? Yes, I do not spit on the roads, nor do I litter. I use vinegar, lime, and gram flour to clean the kitchen and spray vinegar to shine my glassware, stoneware, steel utensils and even the TV screen instead of buying harmful chemical cleaners for convenience. I have replaced all the dirty yellow bulbs with CFLs. I have not air-conditioned my flat and not do I plan to do so in future. I use plastic only when necessary and dislike frozen food/tin food intensely. I look for the Ethical Trade logo and buy local produce as much as possible. I carry a jute bag and prefer the roadside subziwallah to convenience stores that seek refuge in the cold storage to stock aged potatoes. But I do insert that large imported olive oil bottle into my shopping cart since I can’t resist sprinkling it on brussels sprouts. I even have a few creepers meandering through the railings in the balcony that help me connect my fingers with the earth because the Mahatma once said: “To forget how to dig the Earth and to tend the soil is to forget ourselves”. All this may have made me a 100 per cent eco-friendly person only if I were living on a perfect planet not pounded by the disasters of global warming. I would have lay wrapped up in my own microcosm of self-righteousness forever if I were not directly responsible for generating the waste that brings out blisters on the face of the earth. But we are living in a different world—one that’s struggling to keep its creatures from going extinct; one that’s slipping into a deep abyss because somebody once said “here and now” and all of us rushed to buy that from a departmental store in a tin. It’s sinking and that’s true. When there is no denying this truth, then why this resistance? Why can’t I at least give it a try? 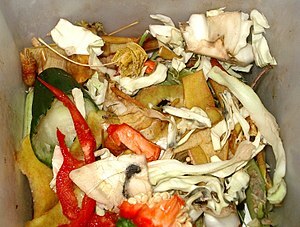 Then it began – putting all the dry waste first into one large bin and then separating it. A few days into this exercise, I realised that we do not normally generate metal and e-waste on a daily basis and hence, no need to rack my brains over it. The first priority is paper and plastic waste. Since old newspapers/magazines lay in a corner for recycling and paper shreds end up in the kitchen waste, it boiled down to only two bins in the living room—one for bio-waste and another for plastic waste. Yet another for collecting the kitchen waste is out in the balcony. Now I would need only one more to dump the metal and e-waste which can be further segregated only once in a fortnight or a month. This entry was posted in Endlessly Green and tagged bio-waste, Biodegradable waste, e-waste, Enviroment-friendly, Global warming, jute bag, kitchten waste, plastic waste, waste management, Waste segregation at source, yellow bulbs. Bookmark the permalink. ← Dress code to women & girls, clean chit to rapists? waste plastic is a keen interest, Subscribed!